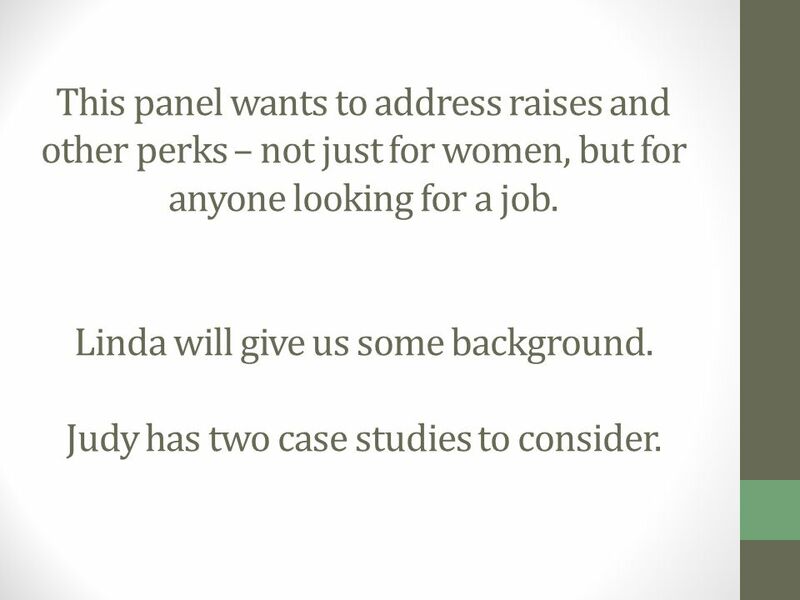 4 This panel wants to address raises and other perks – not just for women, but for anyone looking for a job. 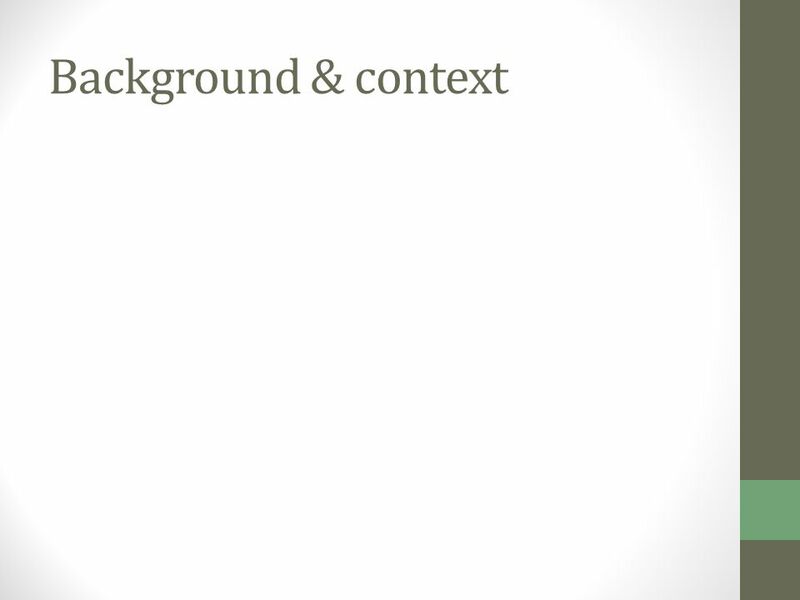 Linda will give us some background. 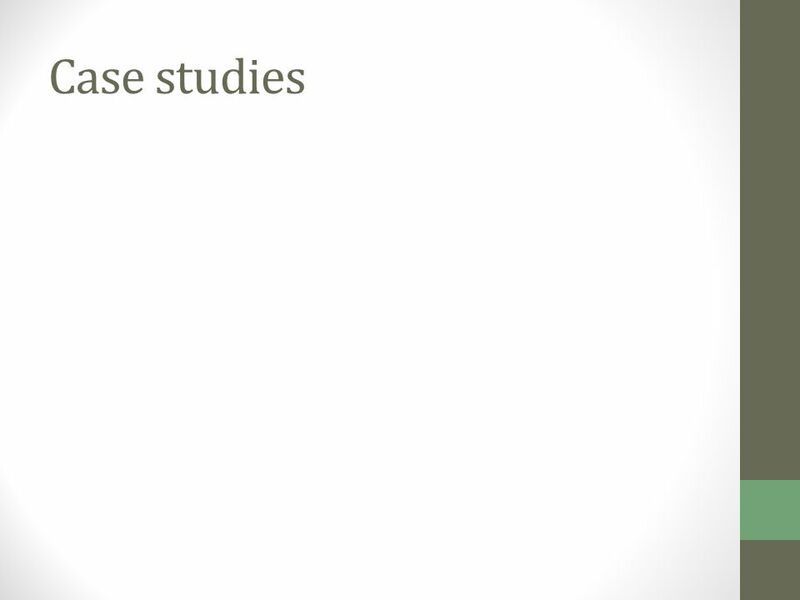 Judy has two case studies to consider. 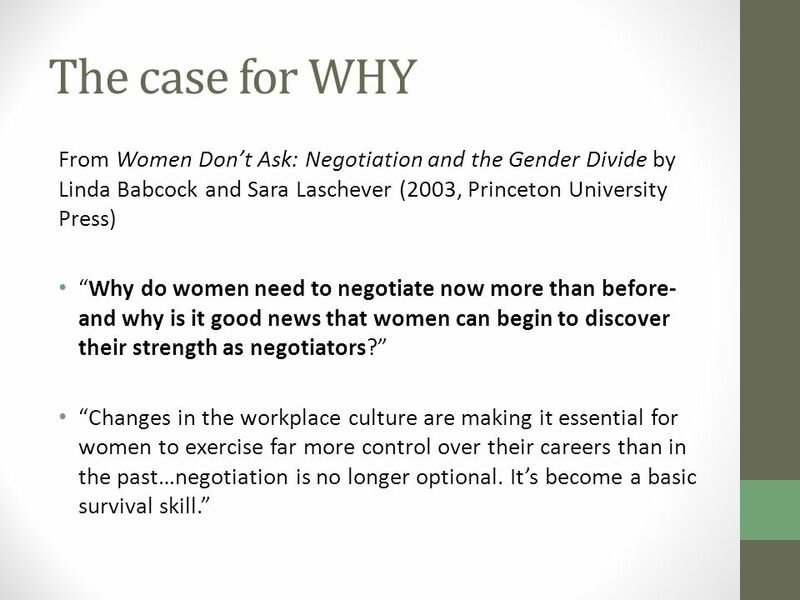 9 The case for WHY The need to negotiate certainly extends beyond the single issue of salary negotiations. 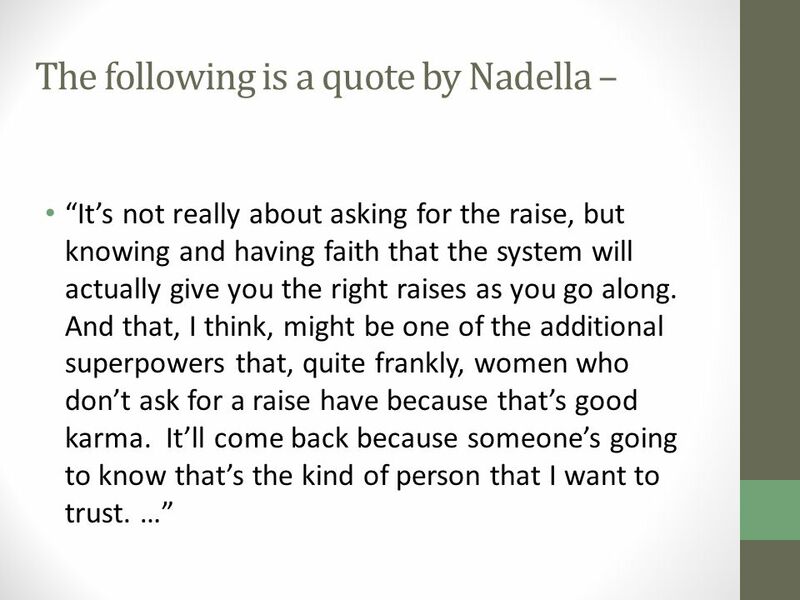 But we shouldn’t underestimate the importance of a one-time negotiation of starting salary. 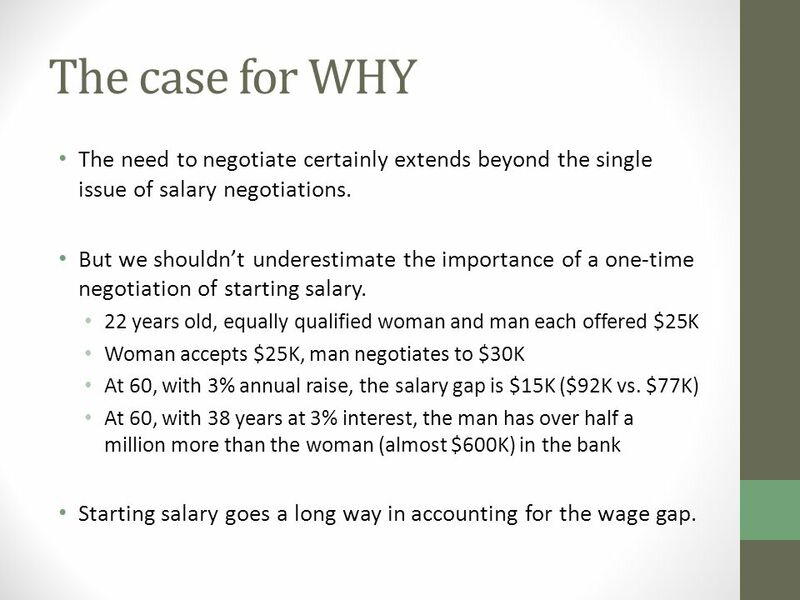 22 years old, equally qualified woman and man each offered $25K Woman accepts $25K, man negotiates to $30K At 60, with 3% annual raise, the salary gap is $15K ($92K vs. $77K) At 60, with 38 years at 3% interest, the man has over half a million more than the woman (almost $600K) in the bank Starting salary goes a long way in accounting for the wage gap. 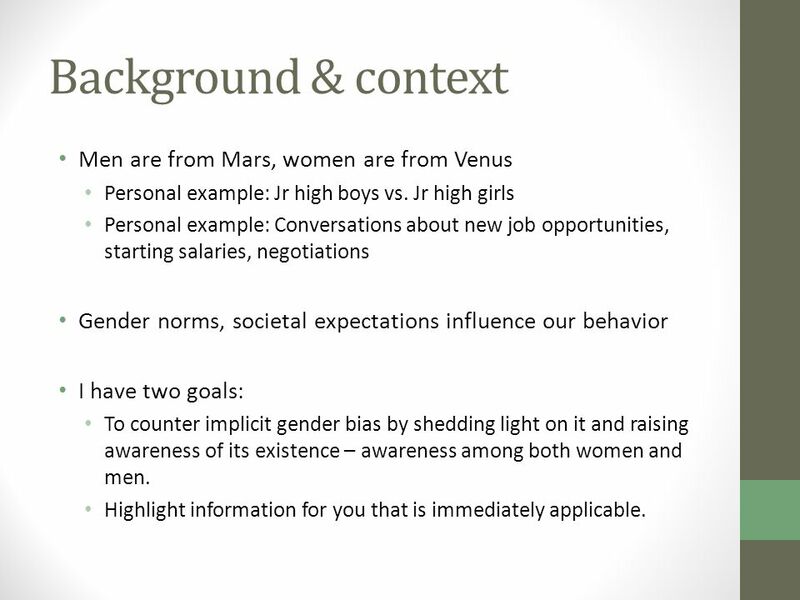 11 Men are from Mars, women are from Venus Personal example: Jr high boys vs. Jr high girls Personal example: Conversations about new job opportunities, starting salaries, negotiations Gender norms, societal expectations influence our behavior I have two goals: To counter implicit gender bias by shedding light on it and raising awareness of its existence – awareness among both women and men. Highlight information for you that is immediately applicable. 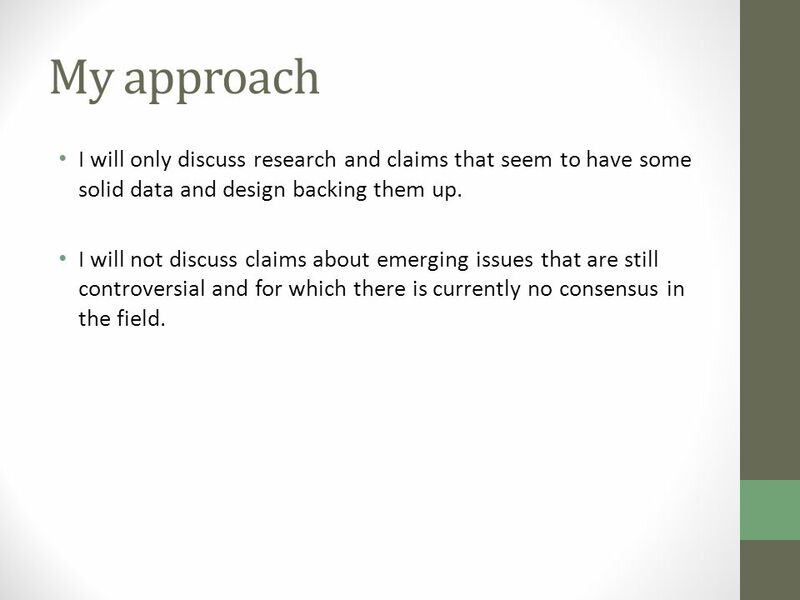 13 My approach I will only discuss research and claims that seem to have some solid data and design backing them up. I will not discuss claims about emerging issues that are still controversial and for which there is currently no consensus in the field. 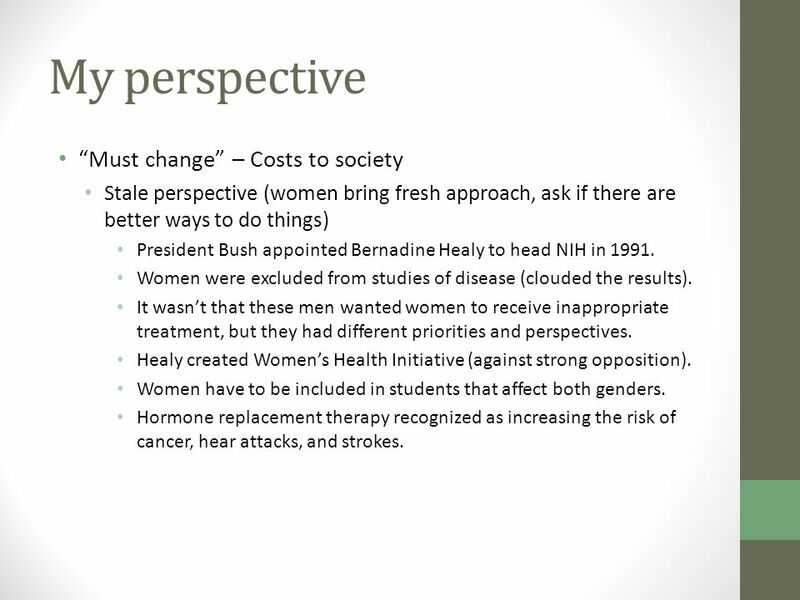 17 My perspective “Must change” – Costs to society Stale perspective (women bring fresh approach, ask if there are better ways to do things) President Bush appointed Bernadine Healy to head NIH in 1991. 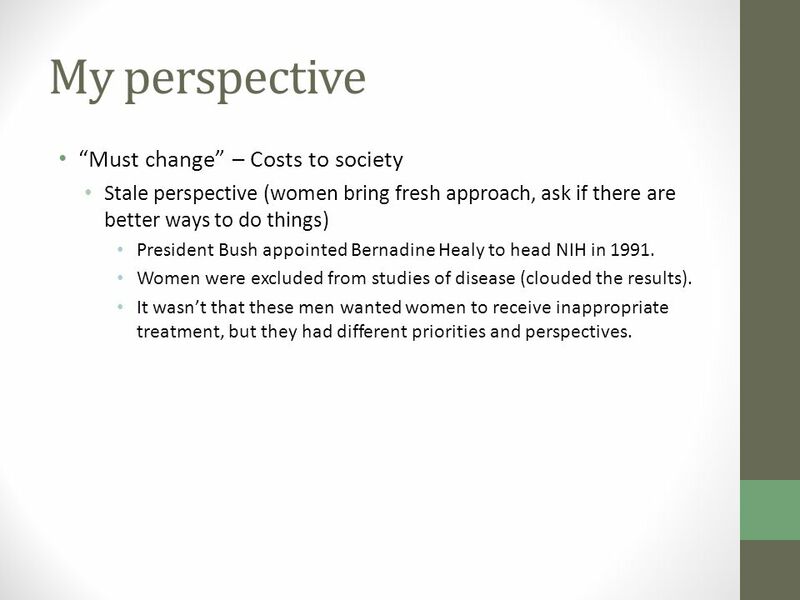 18 My perspective “Must change” – Costs to society Stale perspective (women bring fresh approach, ask if there are better ways to do things) President Bush appointed Bernadine Healy to head NIH in 1991. Women were excluded from studies of disease (clouded the results). It wasn’t that these men wanted women to receive inappropriate treatment, but they had different priorities and perspectives. 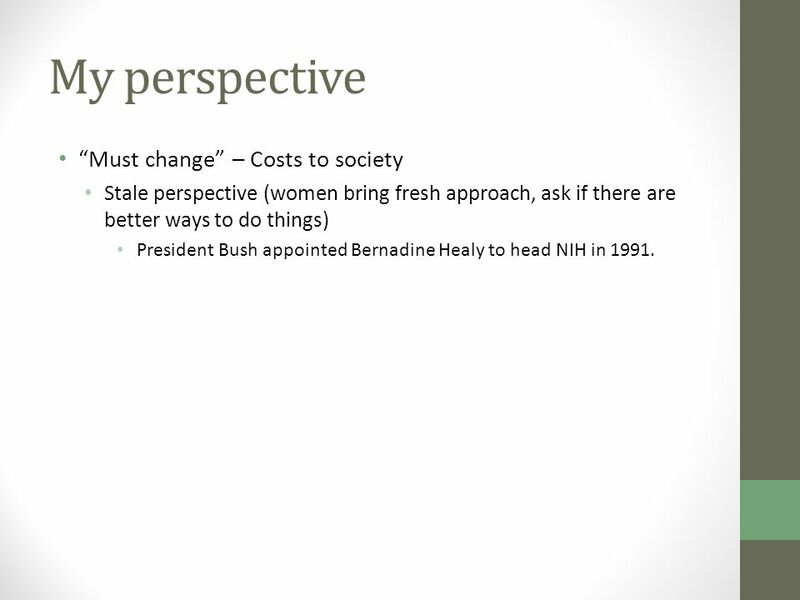 19 My perspective “Must change” – Costs to society Stale perspective (women bring fresh approach, ask if there are better ways to do things) President Bush appointed Bernadine Healy to head NIH in 1991. 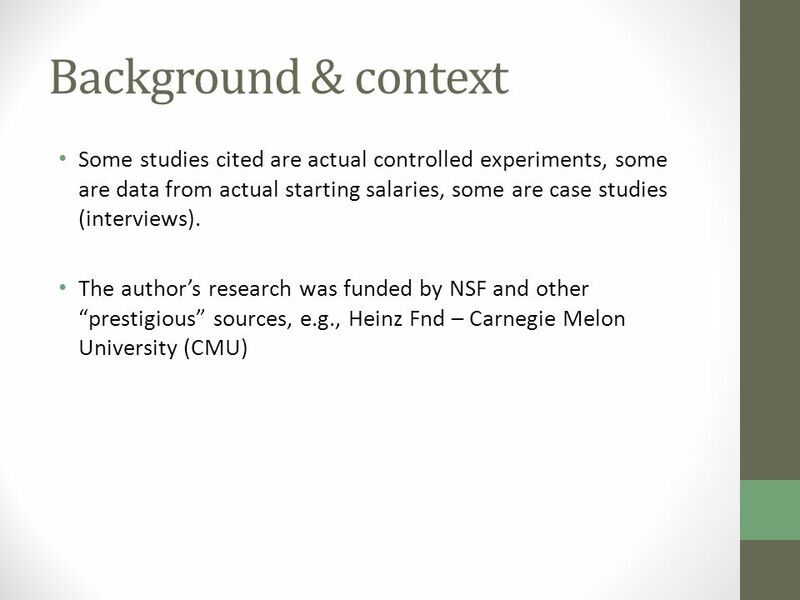 Women were excluded from studies of disease (clouded the results). It wasn’t that these men wanted women to receive inappropriate treatment, but they had different priorities and perspectives. 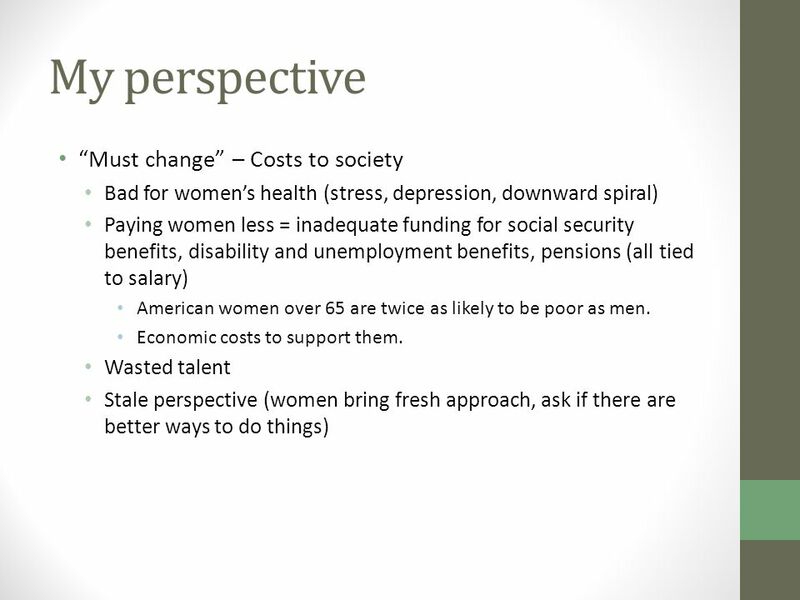 Healy created Women’s Health Initiative (against strong opposition). 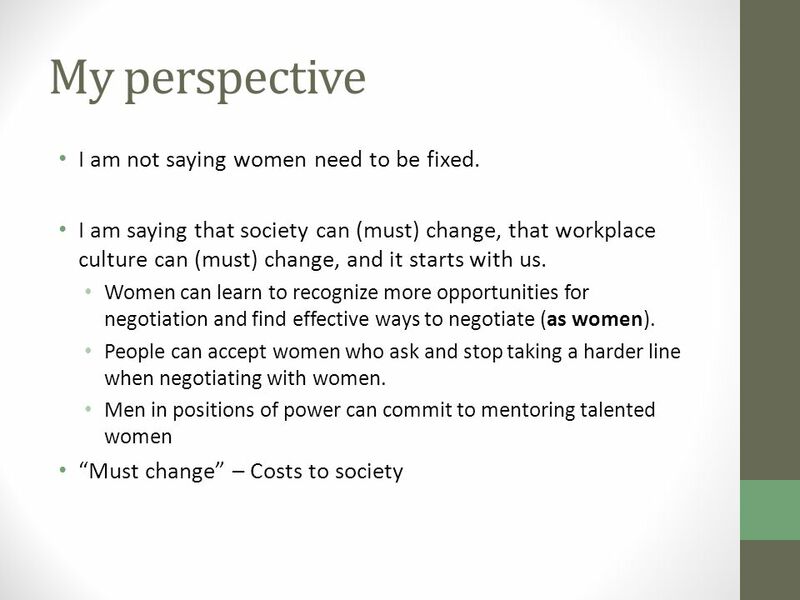 Women have to be included in students that affect both genders. Hormone replacement therapy recognized as increasing the risk of cancer, hear attacks, and strokes. 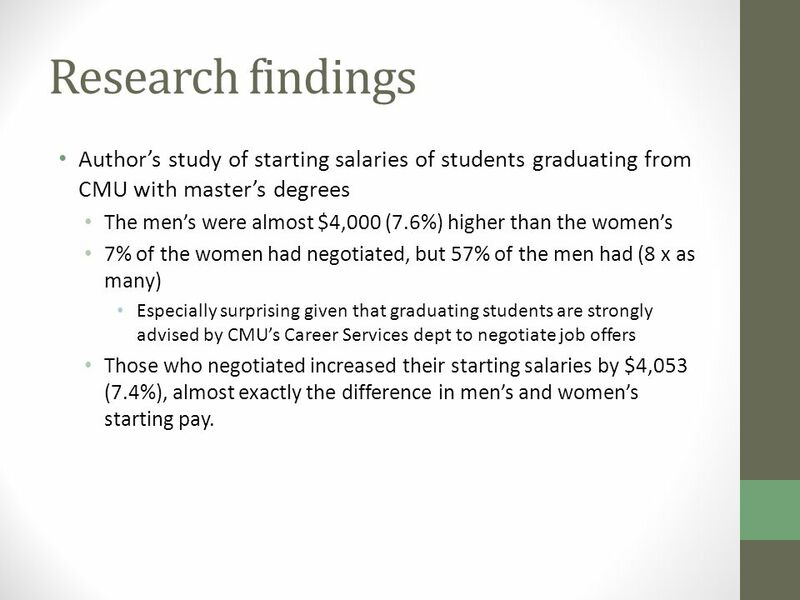 20 Research findings Author’s study of starting salaries of students graduating from CMU with master’s degrees The men’s were almost $4,000 (7.6%) higher than the women’s 7% of the women had negotiated, but 57% of the men had (8 x as many) Especially surprising given that graduating students are strongly advised by CMU’s Career Services dept to negotiate job offers Those who negotiated increased their starting salaries by $4,053 (7.4%), almost exactly the difference in men’s and women’s starting pay. 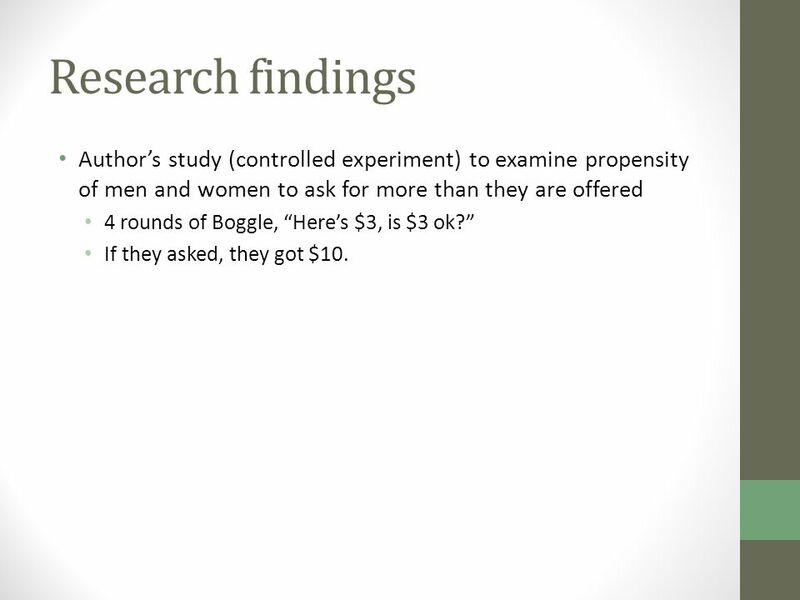 21 Research findings Author’s study (controlled experiment) to examine propensity of men and women to ask for more than they are offered 4 rounds of Boggle, “Here’s $3, is $3 ok?” If they asked, they got $10. 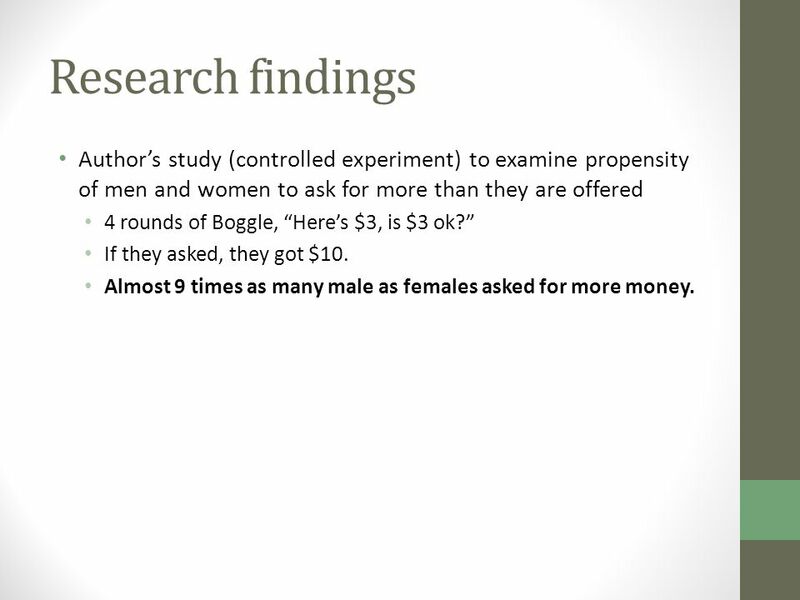 22 Research findings Author’s study (controlled experiment) to examine propensity of men and women to ask for more than they are offered 4 rounds of Boggle, “Here’s $3, is $3 ok?” If they asked, they got $10. 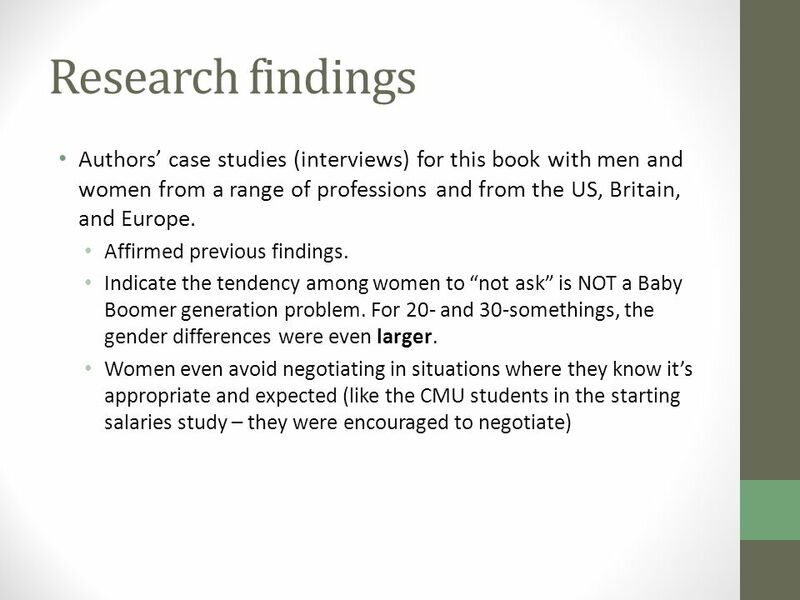 Almost 9 times as many male as females asked for more money. 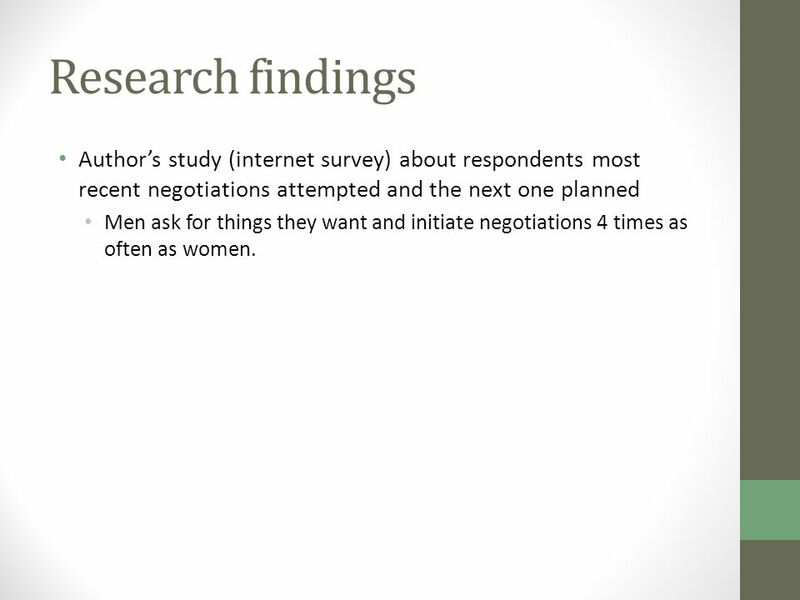 23 Research findings Author’s study (internet survey) about respondents most recent negotiations attempted and the next one planned Men ask for things they want and initiate negotiations 4 times as often as women. 26 Why don’t we ask? We fear we will be seen as pushy or difficult. 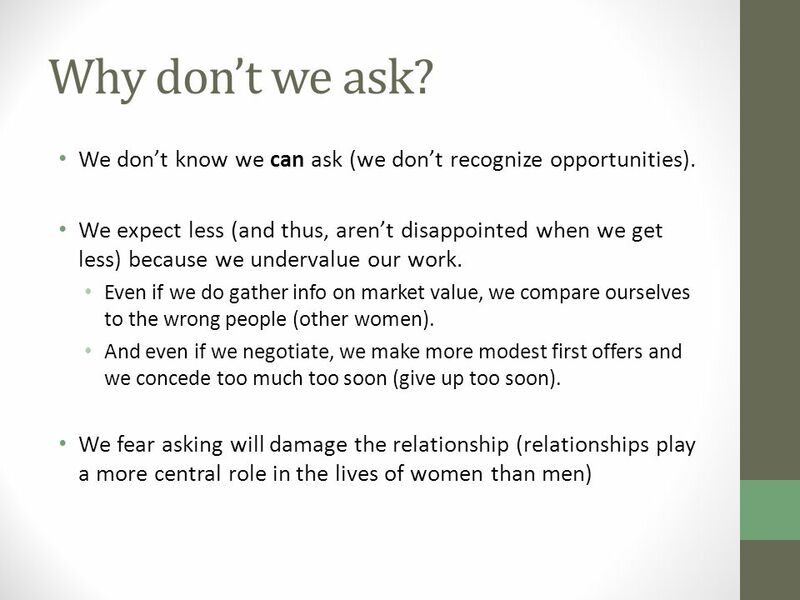 We are less comfortable than men with risk taking (asking). We lack confidence in our negotiating ability. We expect that our hard work will be recognized and fairly rewarded (we will be given what we deserve). 27 What can we do? 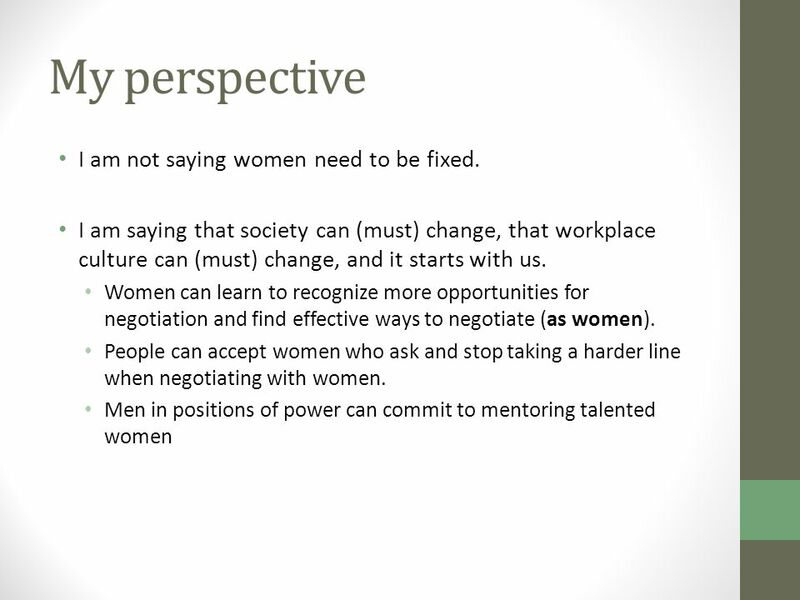 Telling women they should ask isn’t typically enough to help them change. We can help women learn to reframe their interactions with others and overcome their low sense of entitlement, fear, or caution. Help them (learn to) research and set aggressive yet obtainable goals. 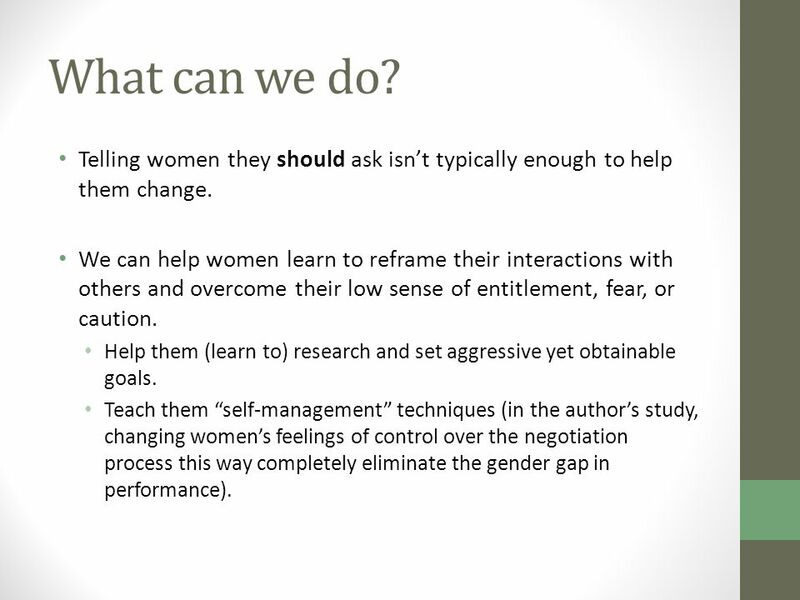 Teach them “self-management” techniques (in the author’s study, changing women’s feelings of control over the negotiation process this way completely eliminate the gender gap in performance). 28 Self-management techniques Articulate the barriers and challenges you face in obtaining what you want (obstacles that cause you anxiety or stress). Identify which of these are real and which are imagined. 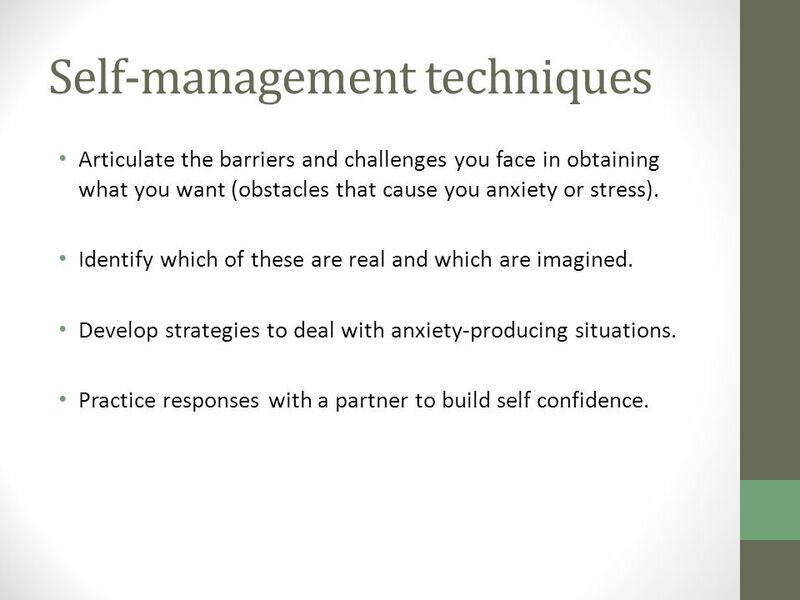 Develop strategies to deal with anxiety-producing situations. Practice responses with a partner to build self confidence. 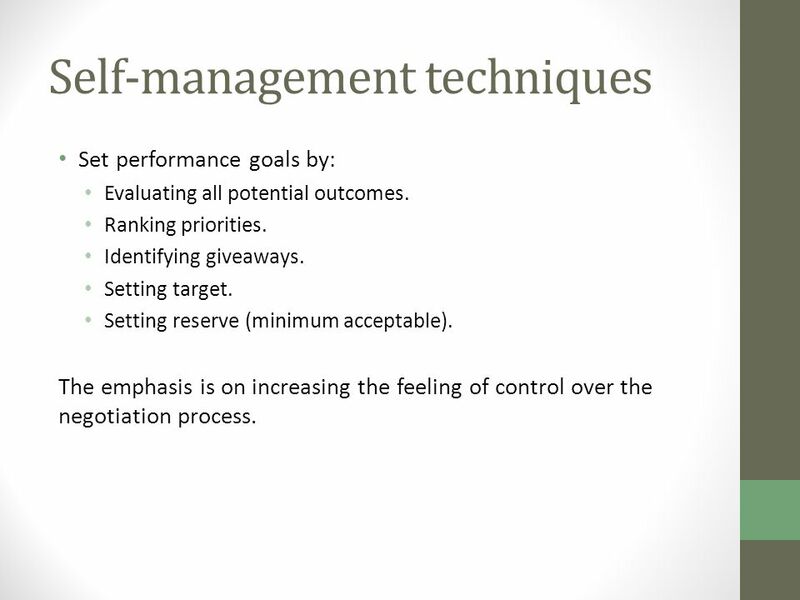 29 Self-management techniques Set performance goals by: Evaluating all potential outcomes. Ranking priorities. Identifying giveaways. Setting target. Setting reserve (minimum acceptable). The emphasis is on increasing the feeling of control over the negotiation process. 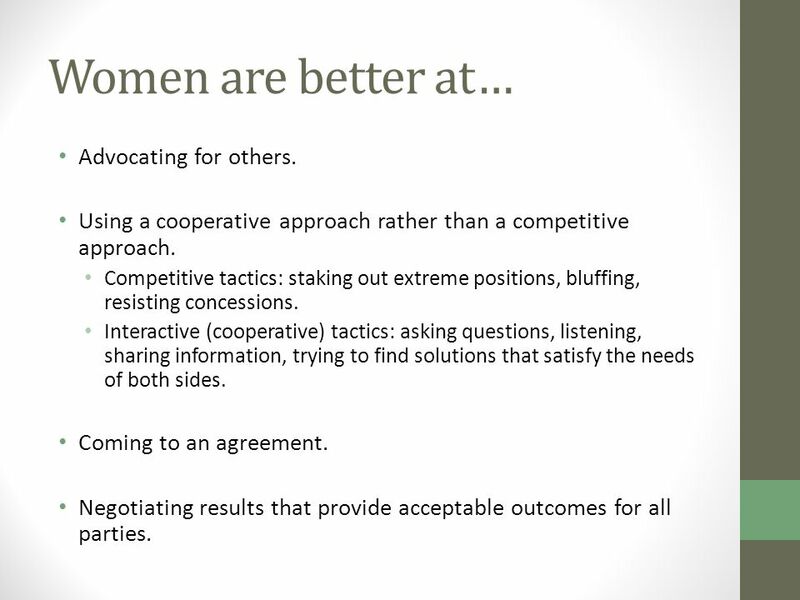 30 Women are better at… Advocating for others. Using a cooperative approach rather than a competitive approach. Competitive tactics: staking out extreme positions, bluffing, resisting concessions. Interactive (cooperative) tactics: asking questions, listening, sharing information, trying to find solutions that satisfy the needs of both sides. Coming to an agreement. 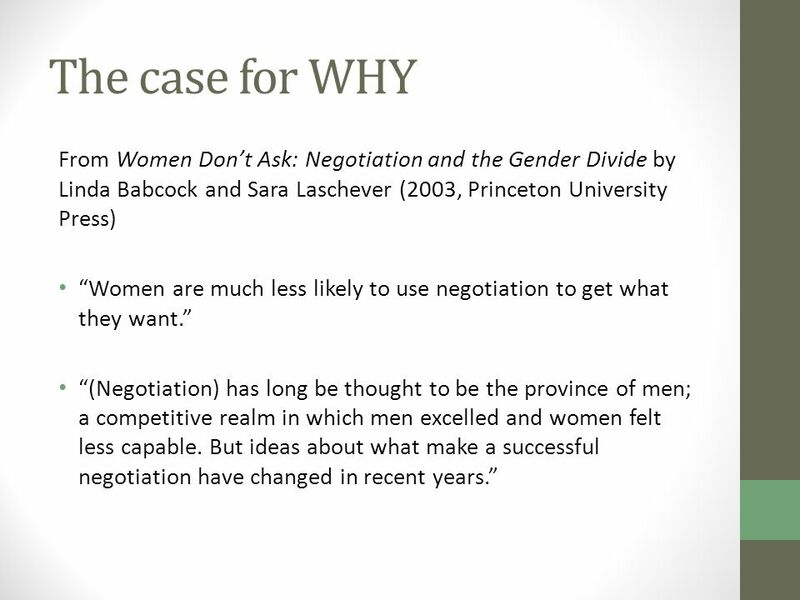 Negotiating results that provide acceptable outcomes for all parties. 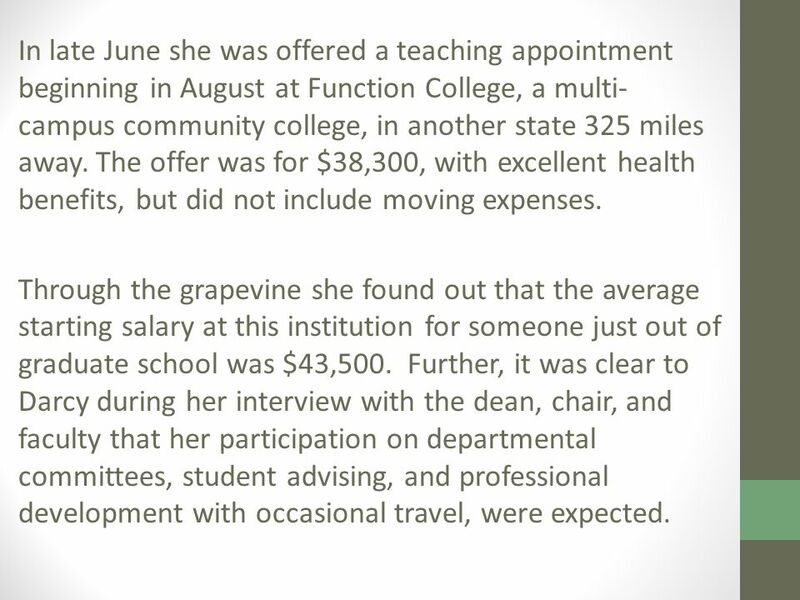 33 In late June she was offered a teaching appointment beginning in August at Function College, a multi- campus community college, in another state 325 miles away. The offer was for $38,300, with excellent health benefits, but did not include moving expenses. Through the grapevine she found out that the average starting salary at this institution for someone just out of graduate school was $43,500. Further, it was clear to Darcy during her interview with the dean, chair, and faculty that her participation on departmental committees, student advising, and professional development with occasional travel, were expected. 34 If you were Darcy : would you just accept the job and say thank you? would you ask for additional salary, moving expenses or other compensation? what non salary requests would you consider making prior to accepting the position? 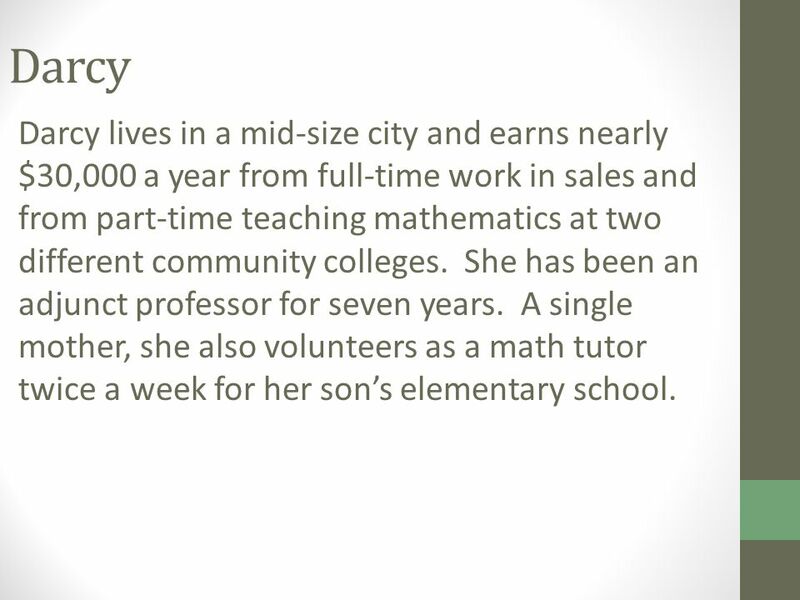 what help would you request so that you could make the greatest positive impact as a first-year, full-time mathematics professor? 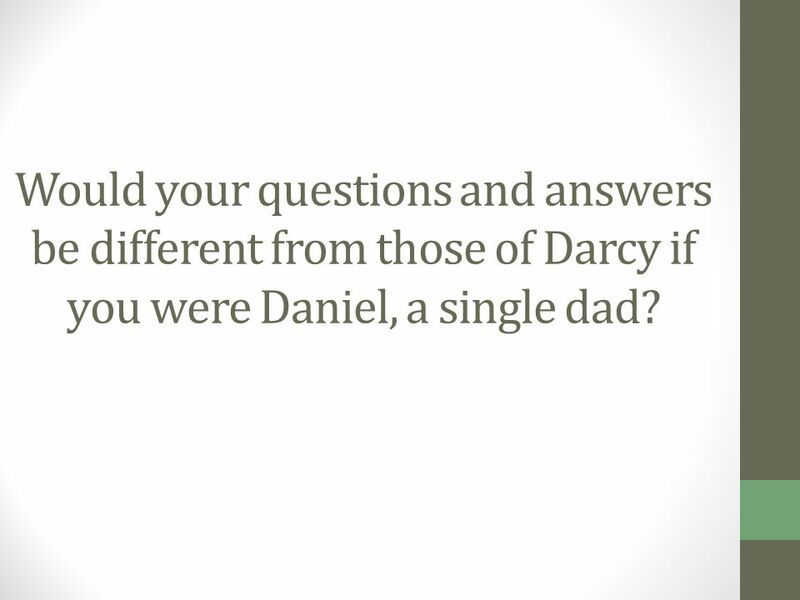 35 Would your questions and answers be different from those of Darcy if you were Daniel, a single dad? 37 As the program matures, Roberto finds himself in administrative meetings more than in classrooms and labs. 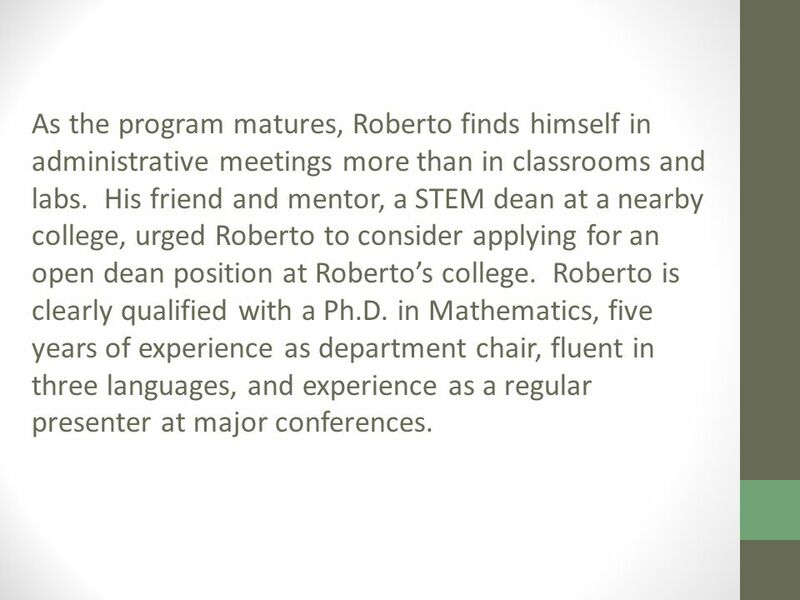 His friend and mentor, a STEM dean at a nearby college, urged Roberto to consider applying for an open dean position at Roberto’s college. 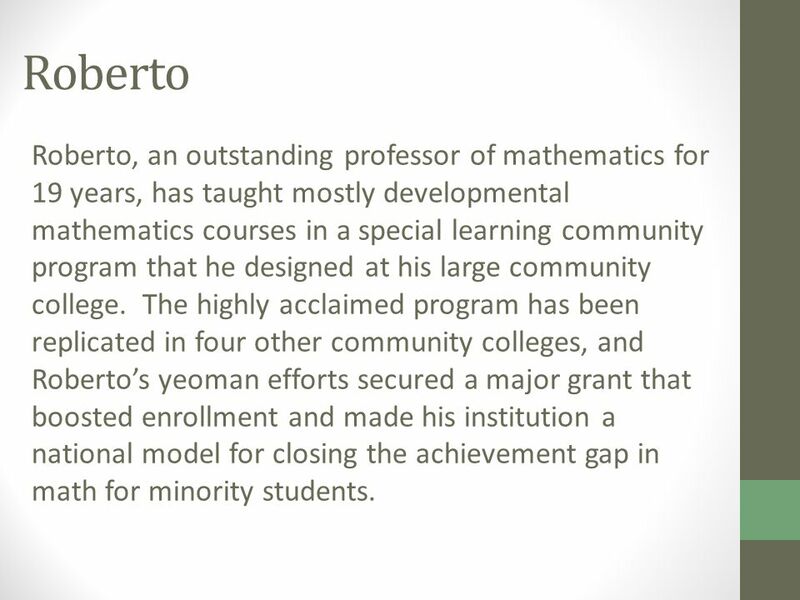 Roberto is clearly qualified with a Ph.D. in Mathematics, five years of experience as department chair, fluent in three languages, and experience as a regular presenter at major conferences. 38 Roberto never really thought about going into administration which his colleagues referred to as “the dark side.” He has been very comfortable with a nine- month teaching schedule, leisurely summers, and with being a tenured faculty member at an institution that did away with tenure 15 years ago. He was able to support his family on his nine month salary of $82,000. 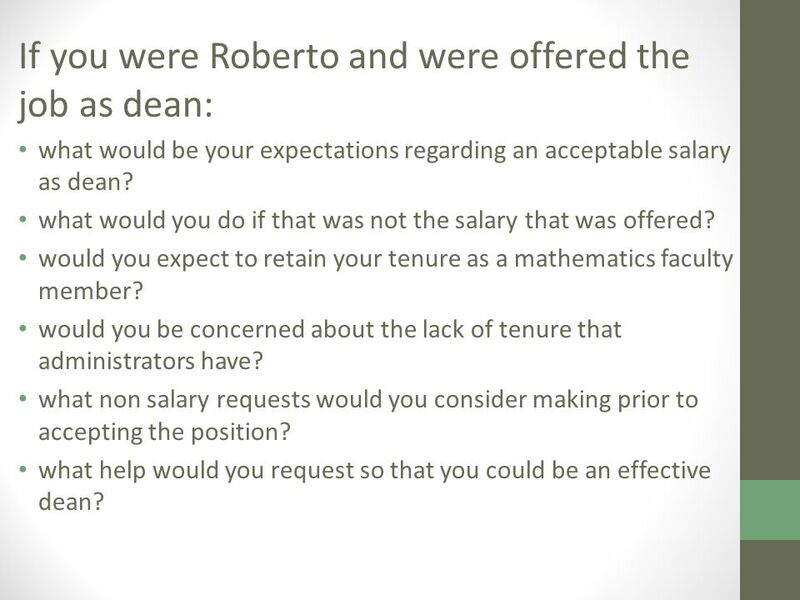 39 If you were Roberto and were offered the job as dean: what would be your expectations regarding an acceptable salary as dean? what would you do if that was not the salary that was offered? 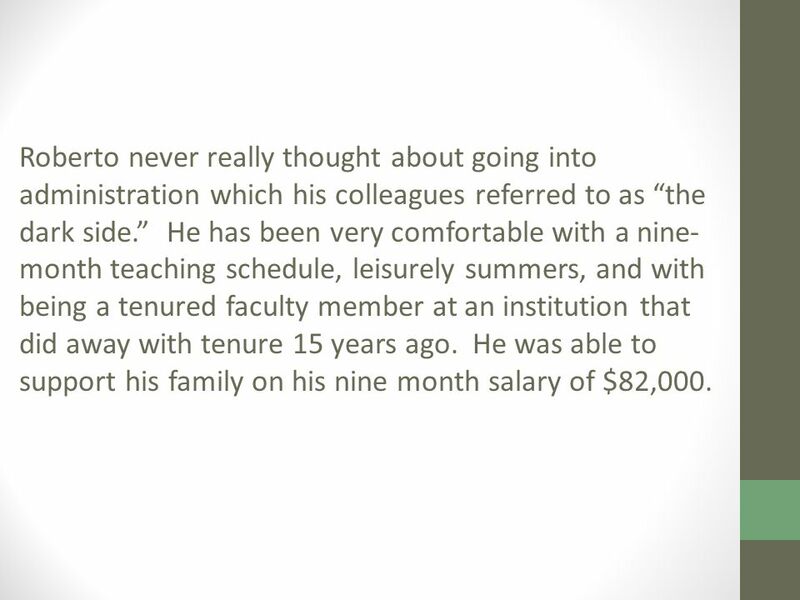 would you expect to retain your tenure as a mathematics faculty member? would you be concerned about the lack of tenure that administrators have? what non salary requests would you consider making prior to accepting the position? what help would you request so that you could be an effective dean? 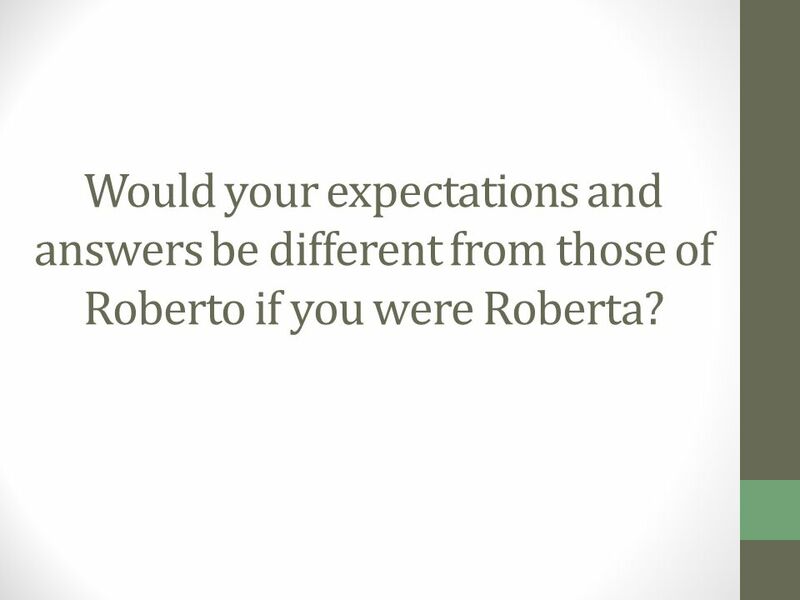 40 Would your expectations and answers be different from those of Roberto if you were Roberta? 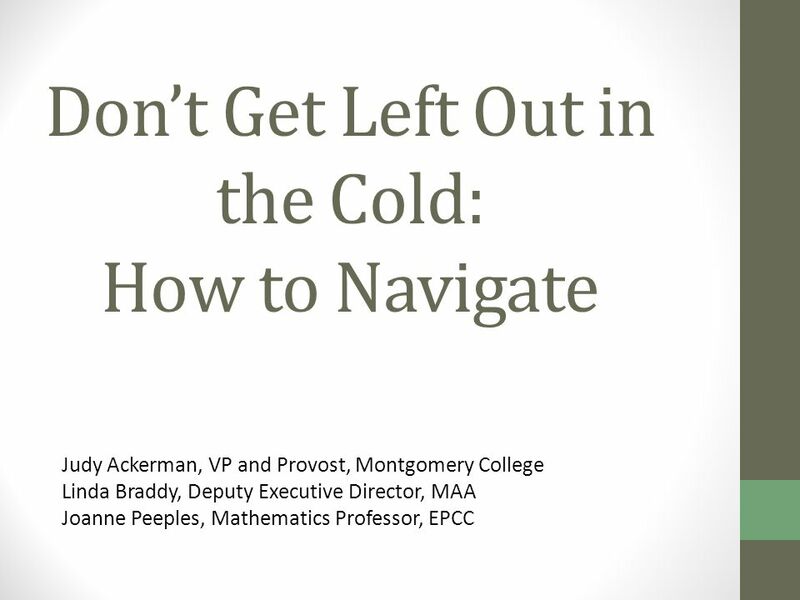 Download ppt "Don’t Get Left Out in the Cold: How to Navigate Judy Ackerman, VP and Provost, Montgomery College Linda Braddy, Deputy Executive Director, MAA Joanne Peeples,"
A Matter of Ethics How to incorporate ethics into your Mortar Board chapter, and beyond! Agenda: 1.Learn about career changers, the reasons they change careers, and suggestions for managing change. 2.Learn about the negative thoughts that can. Changing Gears.. WHAT DO MEN LONG FOR, AGONISE OVER, ASPIRE TO? WHY IS IT MEN ARE OFTEN SILENT IN DARK AND DANGEROUS, OR DIFFICULT SITUATIONS? WHY DO. Fostering Women Friendly Aviation Businesses Presented by Mireille Goyer Founder of Women Of Aviation Worldwide Week. ARE WE EQUAL YET? 2012 IBT’S WOMEN CONFERENCE SAN FRANCISCO Me Marie-France Veilleux, Teamsters Québec, local 1999. Why So Few? 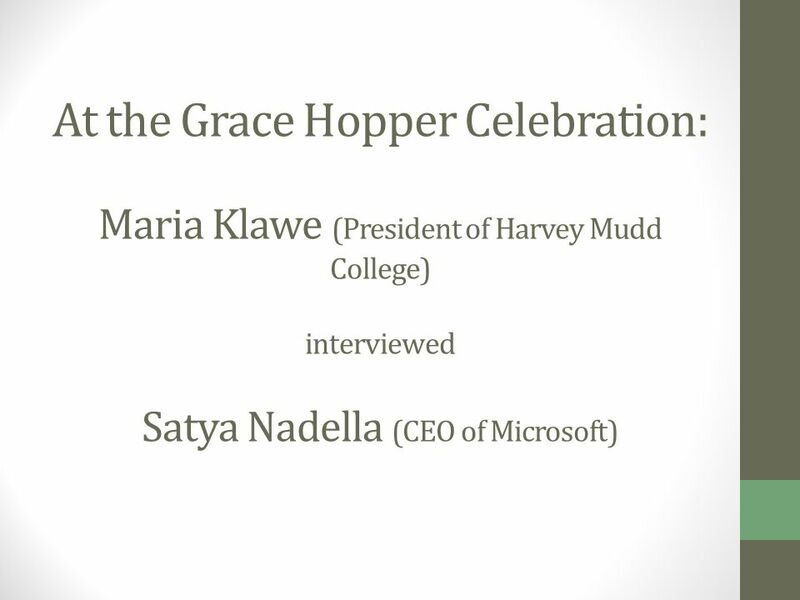 Women in Science, Technology, Engineering, and Mathematics. 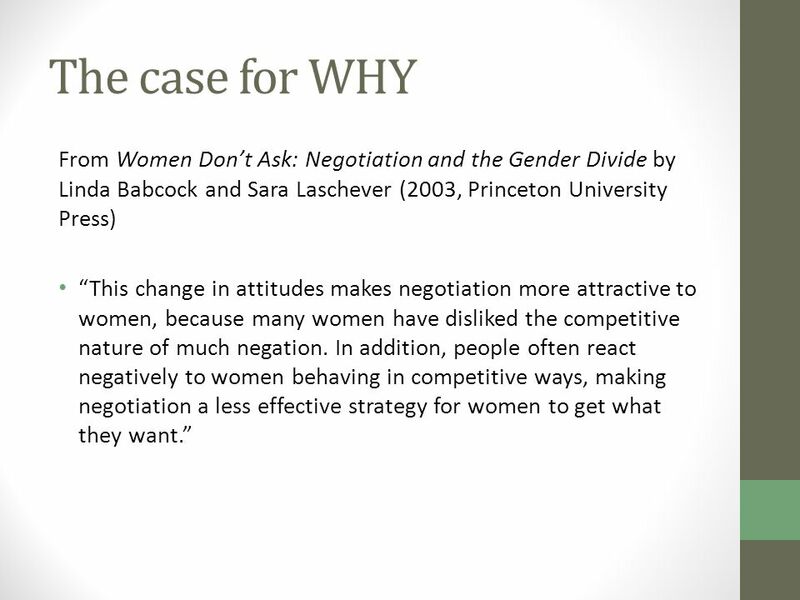 Women & Negotiation Presentation by Horacio Falcão. What Happens When They Leave? 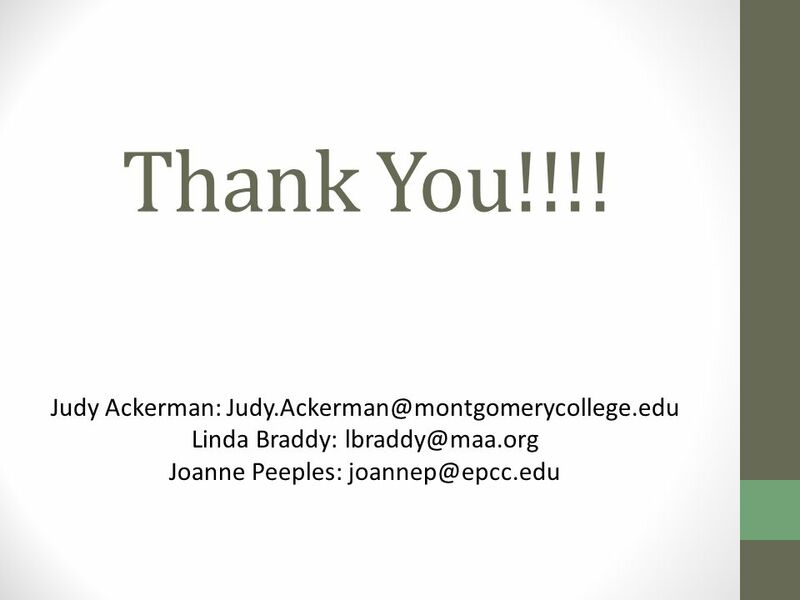 An Examination of Rural Appalachian, First-Generation Non- Persisters OHAAA Presentation June 20, 2014 Ginny Cottrill, Ed. Interviewing Isn’t Everything, It’s the Only Thing. Ironelly Ozuna Bell Multicultural High School Research Paper. Briefing: NYU Education Policy Breakfast on Teacher Quality November 4, 2011 Dennis M. Walcott Chancellor NYC Department of Education. NEGOTIATING YOUR FUTURE. NEGOTIATING IS A BIT LIKE BREATHING. YOU DON’T HAVE TO DO IT, BUT THE ALTERNATIVES AREN’T VERY ATTRACTIVE. 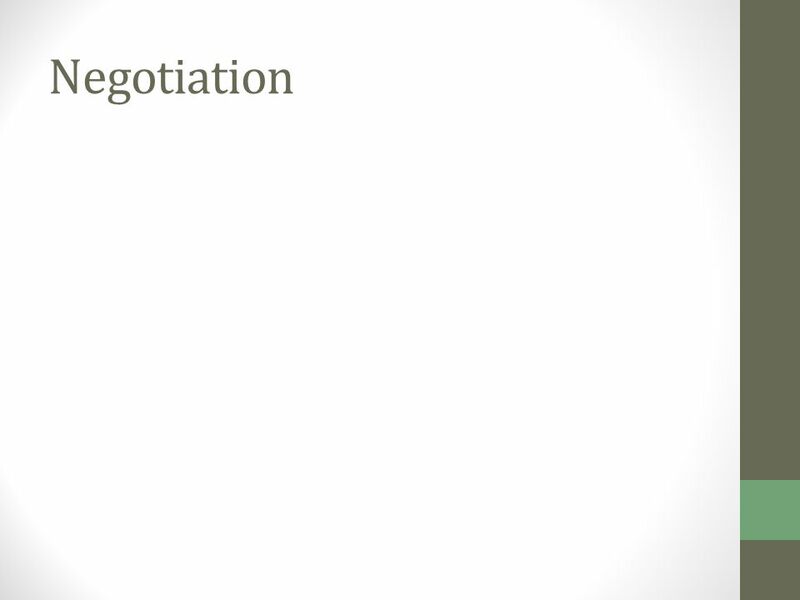 NEGOTIATION IS THE.